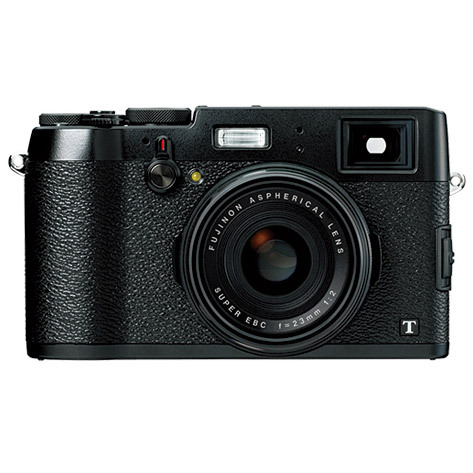 A few weeks ago, I compulsively bought the Fujifilm x100t, a compact mirrorless camera. 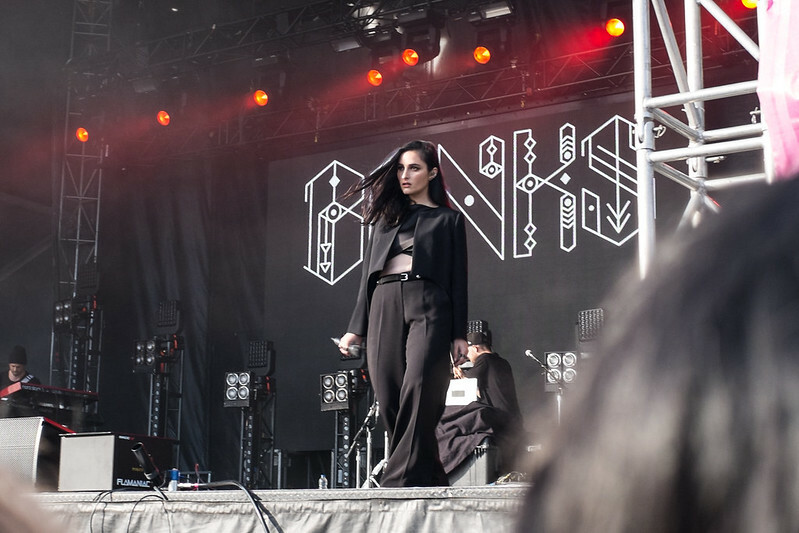 It was the second day of Bestival, and I had spent the first day lugging around a DSLR after I was told that photo passes were super limited. I still wanted to have access to a decent camera the second day but knew that it wasn’t worth carrying my entire DSLR kit. Fast forward few weeks later and I regret nothing of my compulsive buy. This camera is amazing. The 23mm fixed lens has an aperture of f2 so it has great possibilities. The 35mm lens used to be one of my favourites on my DSLR and this is the equivalent on a crop frame. Sure, I can’t zoom but the limitations allows to be a more creative photographer. That being said, this camera is super sharp, works better at times than my 60D in low light and is so super light that I can carry around everyday. Now there’s no excuse for my social media and blog photos not to be perfect quality! As you can see this is one powerful little camera! I am an introvert. I read a wonderful post on Lifehacker that properly defined what an introvert is. Introverts aren’t always shy or hate people. The big identifying factor is that social interactions take energy. They can wear me out. Recently I have been pushing myself a little bit harder to use more of this energy. This can be super hard after work. But I’ve been attending more events, meetups and facing my fears to talk to new people. 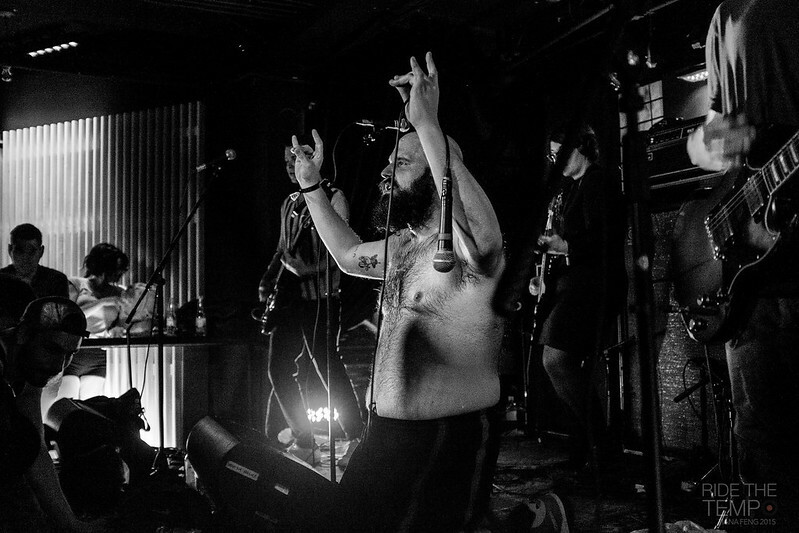 Call it a second wind, but I never regret it when I am in front of great people. It even starts to energize me. That being said, I will never not be an introvert, I don’t think that’s a personality trait you can change. I will always appreciate quiet time where I can read, write or create art. Urbanspoon has now completely merged with Zomato! In case you haven’t noticed,all my previous Urbanspoon buttons have now auto-converted to Zomato ones. You can read my previous introduction to Zomato here. I’m very excited for this change. Urbanspoon has needed a facelift for years. 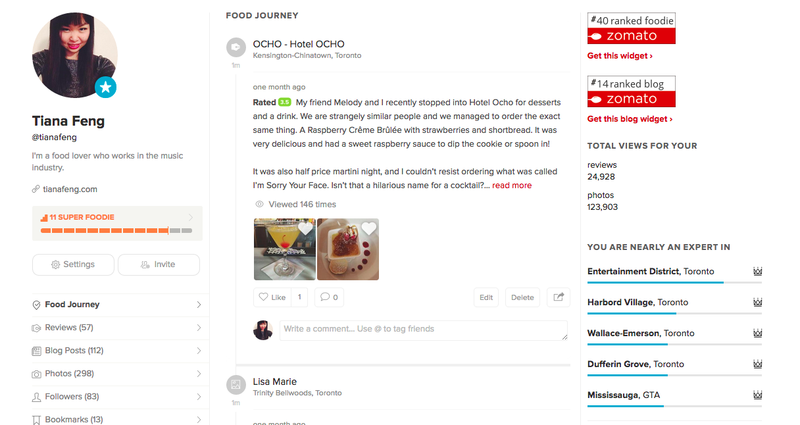 Zomato makes eating out much like a social network. The layout is beautiful and there are even curated recommendations. You can bookmark places to try out later, call for reservations or even book an Uber to the restaurant with the app. If you used to follow me on Urbanspoon, you can now find me on Zomato at https://www.zomato.com/tianafeng. 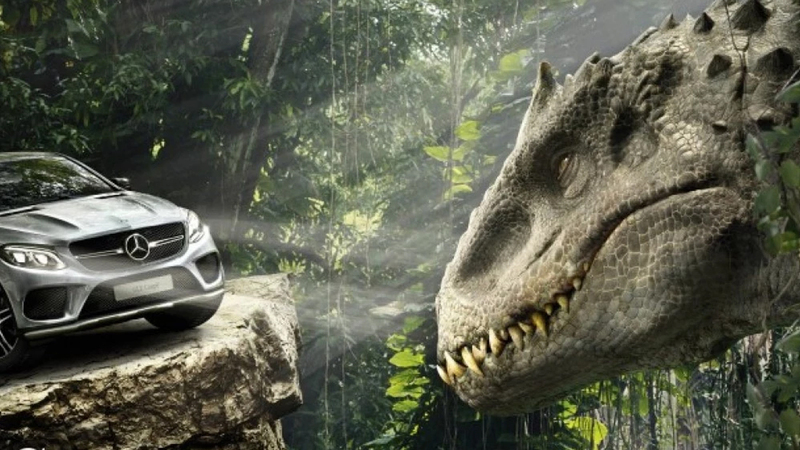 Spoiler alert: If you haven’t watched Jurassic World this post might reveal some things you didn’t want to know. Last night we saw Jurassic World in D-Box. It was my first experience in one of those special moving chairs at the theatre. For this movie it actually worked out well. I felt like I was riding the helicopters or gyrosphere along with the movie characters and we could feel the stomping of the dinosaurs. It didn’t make me sick like I thought it was. It made us feel like we were part of the adventure. 1) There were a lot of pointless backstory between the kids. Also the older kid was a terrible actor. 2) Product placement was hilarious, almost like it was parodying it. 3) Why were the dinosaurs smiling at the end? I still had a great time watching the movie, after all it is a movie about Dinosaurs, just don’t go into it expecting too much! I love D-Box, if you ever have the choice to experience it, take it! Today is a historic day! Congratulations to my friends down South who now have the right to marry. Love who you choose. 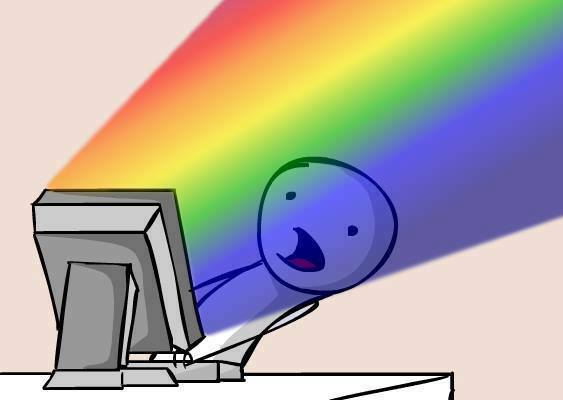 I’m so happy that my social feeds have been rainbows. A friend and I recently were lamenting the old days and we realized, some of the memories we were thinking of were over 5 years ago. It’s been a crazy five years. So much has happened and I’m a much different person than I once was. To think that this blog didn’t even exist in this form 5 years ago is totally weird. I’ve made so many gigantic life decisions in this time. I left an emotionally-abusive ex. 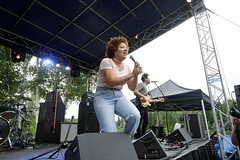 I steered myself in a different direction after finishing my Bachelors of Music. These were two of the best choices I have ever made. I became more in charge of my emotions and gained a more stable state of mind. I faced some fears and met so many great people. I got to chat with Johnny Cupcakes and hang out with Chris Pirillo (and even appeared on his Vlog). Some of my Twitter friends became real life ones and this is still an ongoing thing. 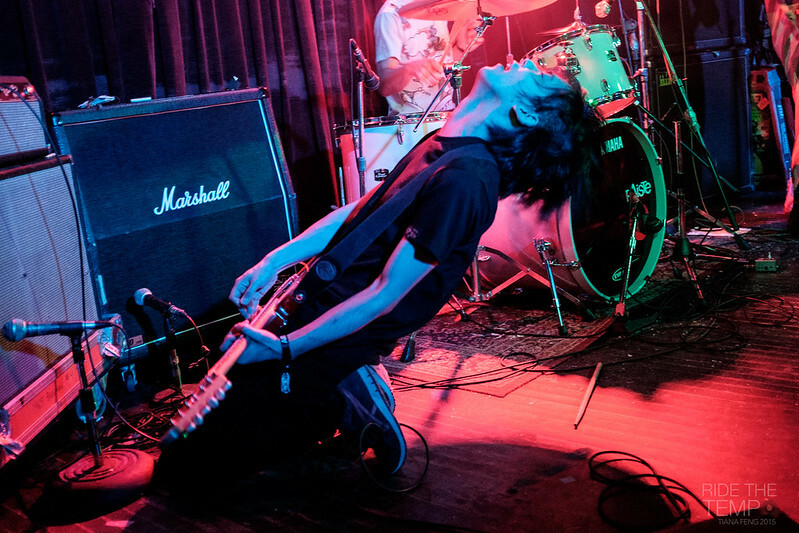 I photographed my first music festivals, and then became a sort of veteran in the pit. I tried so many new restaurants and ate a lot of new food. I grew a social media following that allowed me to do some really random things. I interned and worked at some unexpected things. I watched my best friend get married and was her maid of honour. I met Nash, the love of my life and partner in shenanigans. He even met my parents. What these five years have really taught me were to take risks, seek adventure, be positie and to honour who I am. I know that I’ll never stop going on tiny adventures and I’m excited to reflect again in 5 years! ❤️ #Repost @sarahrix with @repostapp. ・・・ ✌🏻 #BestivalTO with the best people. A few weeks ago, I went to Bestival. While the music was heavy on DJ sets (which I’m not the biggest fan of), I still had a lot of fun. 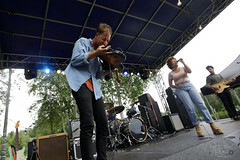 There were a lot of things that this festival did differently that made the overall experience an interesting one. There were plenty of things to do besides see music, including a tent where you could knit. People got married in an inflatable church with a rapping pastor. Sponsor Perrier brought in a private greenhouse party. I randomly received a free signed Owen Pallett CD from Fido for tweeting about the festival! You could drink fruit juice out of the fruit. and of course the food was delicious! Will talk more on that later. I’m a little late posting this but my June Birchbox arrived last week and the theme of the month is Adventure. It had a code for a draw as well as some travel tips from Meghan Markle of The Tig. 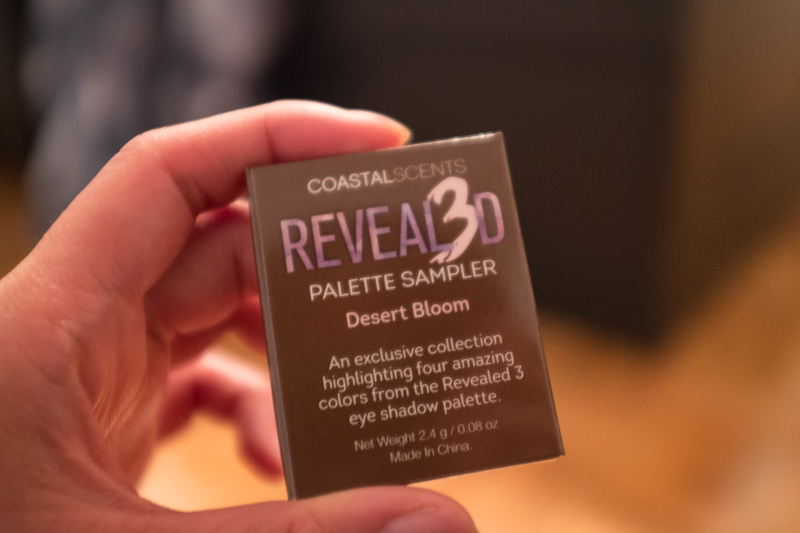 The first item was this Coastal Scents Palette Sampler from their Revealed 3 collection. I love Coastal Scents’ eyeshadow, they are always pigmented and affordable so I’m excited to try this. 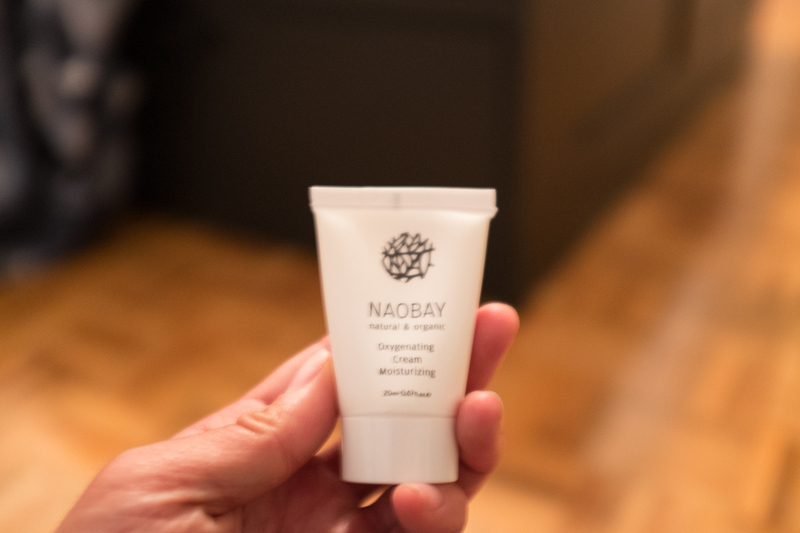 This Naobay Oxygenating Cream Moisturizer is made with avocado and olive oils and is made of 98% natural products. I love the design of this Number 4 (that’s the brand name) clarifying shampoo. 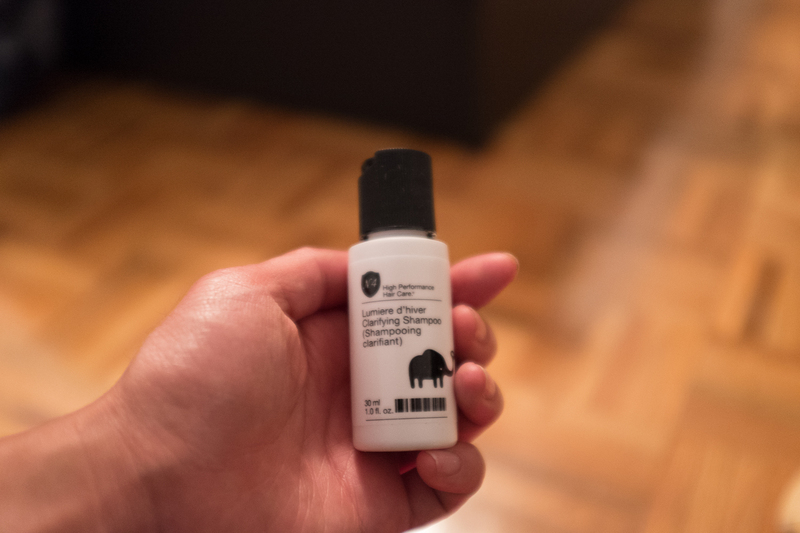 It is full of vitamins to restore lost moisture and shine. 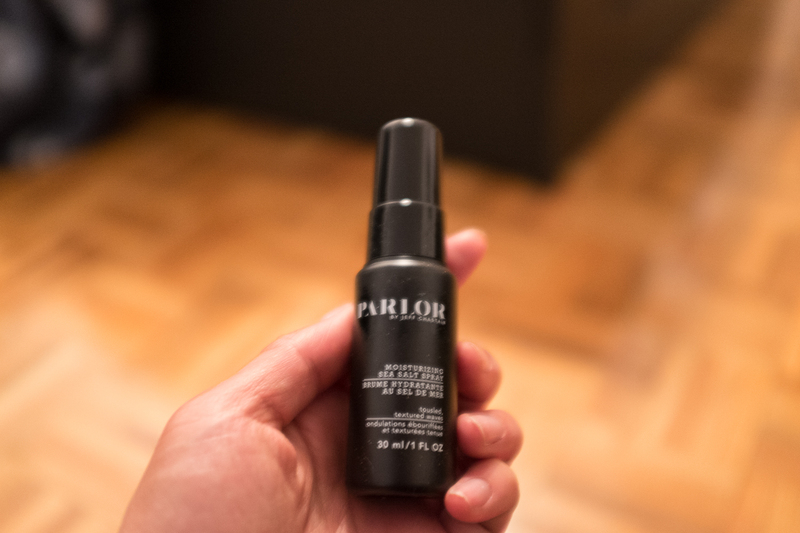 After shampooing I can try this sea salt spray from Parlor by Jeff Chastain. It’s great for getting soft beachy waves. 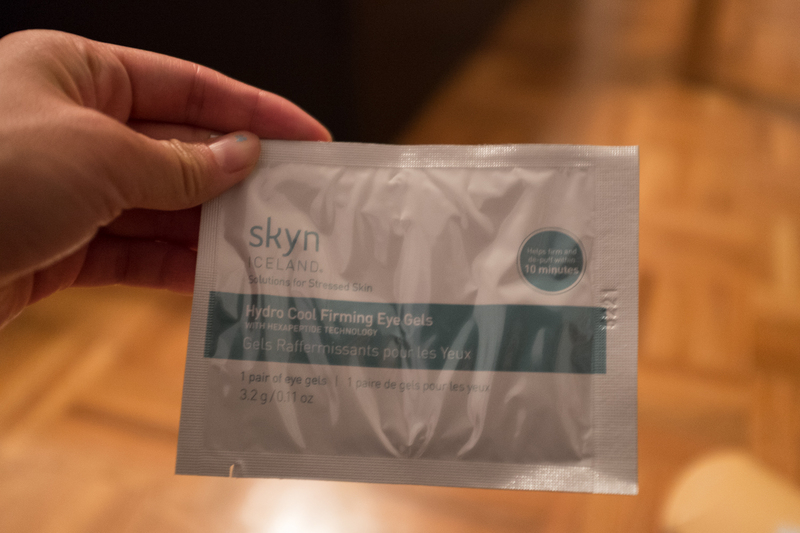 I’ve been having such a busy few weeks that I can’t wait to try these Hydro Cool Firming Eye Gels by Skyn Iceland. Hope I can get rid of some dark circles! 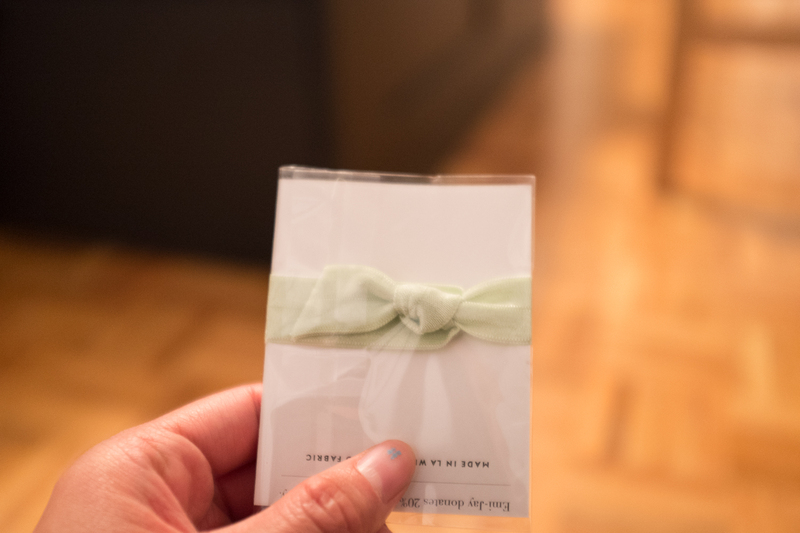 This month there was this bonus little hair tie from Emi-Jay . It’s so cute! I’m in love with this month’s box and can’t wait to have a relaxing night and try some of these things. Nash and I live very close to Pho Jade, which serves Vietnamese cuisine. We’ve gone a couple of times but I totally forgot to write about it. 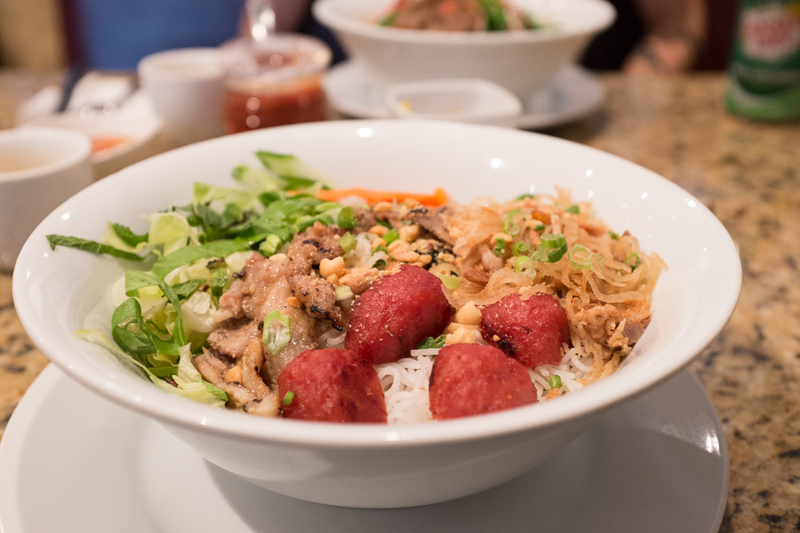 Last week we went again and I ordered the grilled pork and sausage vermicelli. Everything was very flavourful including their version of the fish sauce and the portion was just right. 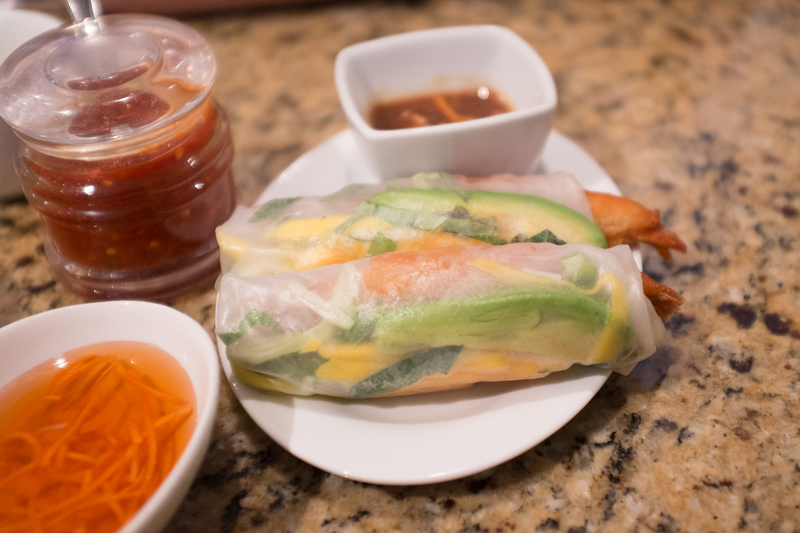 We also had the mango and Coconut Shrimp Fresh Rolls. I’d never had any outside the traditional shrimp ones. This also contained avocado which was a fabulous contrast of texture with the mango and crunchy shrimp. They are a hefty little appetizer so I recommend sharing it if you’re ordering it in addition to a meal. So far, Vietnamese restaurants in Toronto have been a hit and miss but I’m happy to say that this one nearby is a hit! 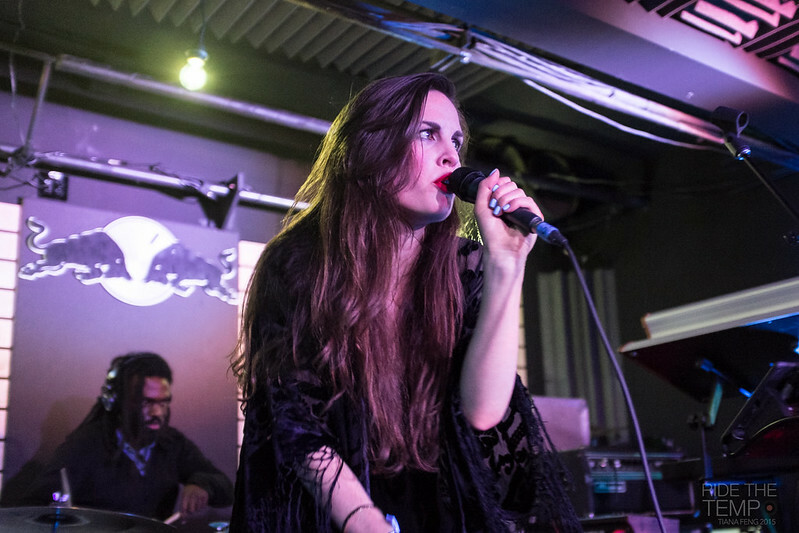 Vote for Your Favourite in the SOCAN Songwriting Prize 2015! 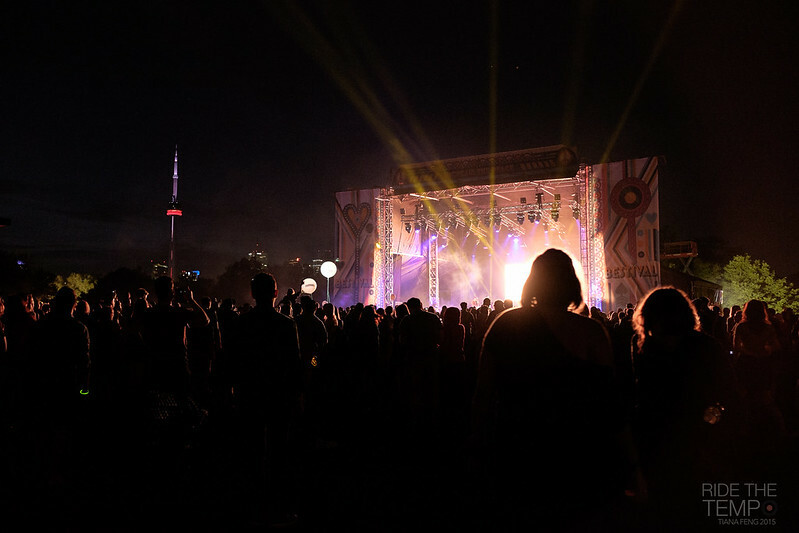 June 21, 2015 Categories Entertainment, Music, Social Media1 Comment on Vote for Your Favourite in the SOCAN Songwriting Prize 2015! I’m helping out with the SOCAN Songwriting Prize again. Do me a favour and vote for your favourite song! Coincidentally all the nominees this year happen to be by female artists. BOO YEAH GIRL POWER.